Playful pup Cookie has a very special trick up his sleeve! Help him ride his skateboard down the ramp and practice for the big dog show. See how many skateboard tricks he can perform—he’s really earned his dog biscuit today! And a hardworking dog deserves a luxurious doghouse, so lie him down for a rest when he's done. Last known price is 39% above the initial Lego retail price! 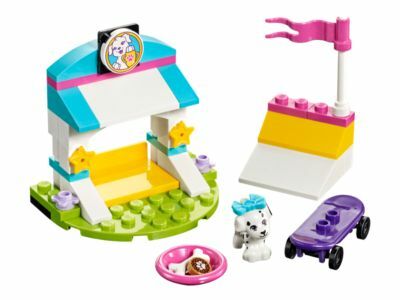 The Puppy Treats & Tricks (41304) Lego set is no longer directly available from the sites below. However, 3rd party partners of these sites might still have the set available. Alternate description Check out Cookie the dog’s skateboarding skills! Includes a Cookie the dog figure. Features a doghouse and a ramp. Accessory elements include a skateboard, dog bowl, dog biscuit, bone and a bow. Help Cookie practice skateboarding down the ramp. Lead him into the doghouse for a good night's sleep. Doghouse measures over 1” (5cm) high, 2” (6cm) wide and 1” (4cm) deep. Combine with the 41300 Puppy Championship or 41303 Puppy Playground for even more jumps, and obstacles to practice with!